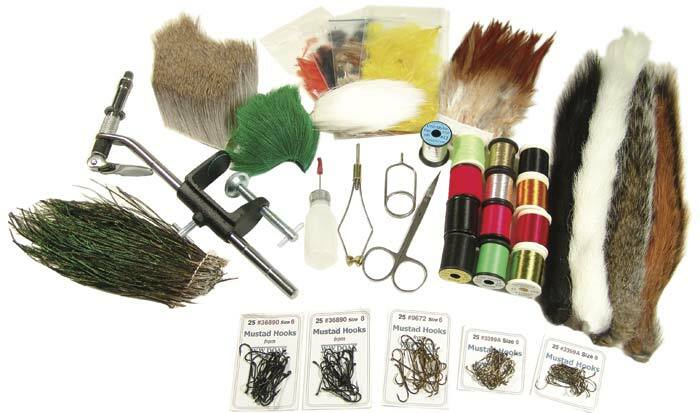 With Sunrise AA vise, scissors, bobbin, hackle pliers, lacquer, applicator, 2 thread, over 100 Mustad hooks, 2 fl. yarn, 2 fl. floss, 3 tinsel, 5 loose neck hackle, black, fox, grey sq. tails, calf tail, brown, green & white deer hair, brown saddle hackle, peacock herl.